The Academy of Motion Pictures Arts and Sciences® recently presented nine Scientific and Technical Academy Awards to current and previous Texas Instruments employees for their contributions in advancing DLP Cinema® technology, which changed how the world sees movies. With more than 100 thousand installations, DLP Cinema® dominates digital cinema exhibition worldwide. The vision of DLP Cinema® began back in 1992, when the DLP® organization was formed at Texas Instruments under Jack Harrod. Jack put together a brilliant team of scientists and engineers to develop all aspects of the new micromirror technology with the hopes that someday it would be good enough to show digital movies - the holy grail of display technology. For over 100 years, movies had been shown the same way, using film projectors. Even after digital editing, movie content was reprinted back to film for theater exhibition. Jack’s leadership was followed by Bob England and John Van Scoter who supported the DLP Cinema® development throughout its productization and rollout phases. In addition to a very special technical team, a unique business development team was also formed to manage the relationships with the Hollywood community and translate the artistic needs into requirements to be executed by the technical team. This strategic business development began with Fred Geyer, followed by Paul Breedlove, Doug Darrow, and Dave Duncan. Doug and Dave eventually became the “face” of DLP Cinema® in the Hollywood community and helped work out the business model for the transition from film to digital. One of the biggest milestone events was the digital premier of Star Wars Episode I – The Phantom Menace, supplied by George Lucas. This event on June 18, 1999, began two weeks after the film opening and was hosted in two theaters, one in Secaucus, NJ and the other in Hollywood. Two technologies were supported in this first digital movie exhibition – DLP® and ILA®. Today, DLP Cinema® prevails with the vast majority of worldwide installations. Sony supplies LCOS-based projectors in some installations. 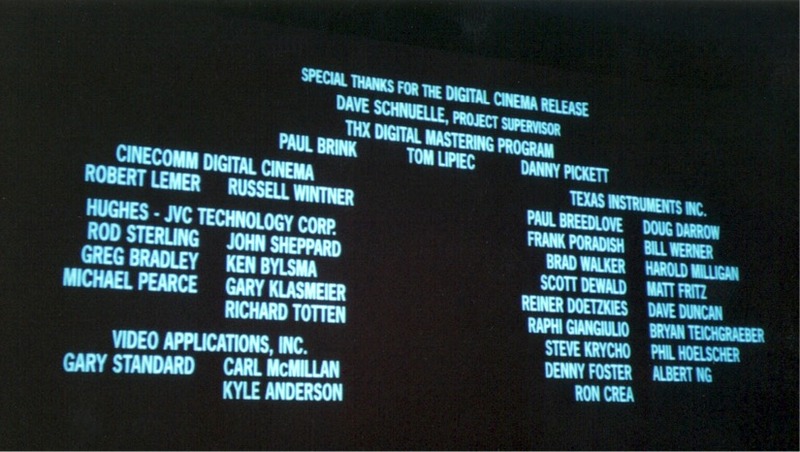 The photo above shows the final credits of the digital release of Star Wars Episode I (in digital freeze frame), recognizing the TI DLP Cinema® team members (on the right) who worked countless hours with many sacrifices to make this a success. Of these, Brad Walker, Scott Dewald, Bill Werner, Greg Pettitt, and Frank Poradish were recognized by the Academy of Motion Picture Arts and Sciences® with Scientific and Engineering Awards. Greg Pettitt worked behind the scenes and had a significant impact on the digital premier but was not listed in the above movie credits. Reiner Doetzkies, Harold Milligan, and Steve Krycho were also recognized by the Academy with Technical Achievement Awards. Everyone in the credits had significant contributions to the digital premier. Additionally, the DLP Cinema® team had a lot of outside support from Loren Nielsen, Matt Cowan, and others who were important to the success. Everyone involved should be proud of this ground-breaking accomplishment, which is just now getting deserved formal recognition. 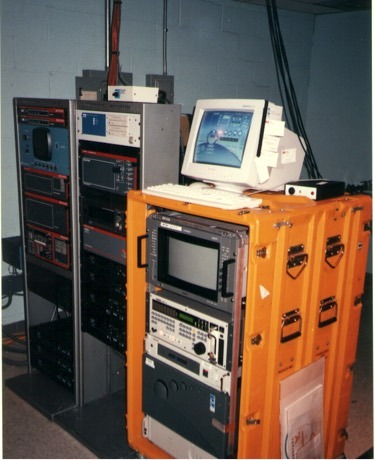 The following photographs show the initial DLP Cinema® projectors, which had many custom breakthrough technologies in optics, electronics, and algorithms. These first projectors executed massive amounts of digital image processing in real time (24 Hz) to achieve the proper “film look”. 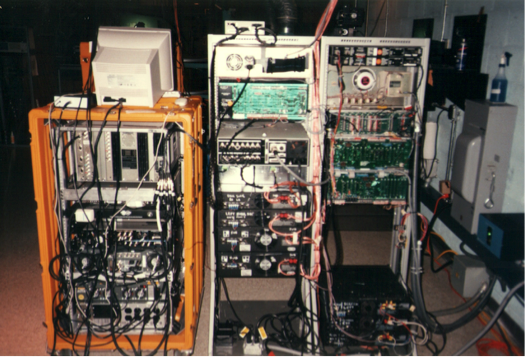 Prior implementations of this type of digital image processing required seconds per frame in multi-million dollar machines to perform the calculations. Real time image processing was deemed impossible to do at that time. The DLP Cinema® engineering team never thought anything was impossible and so they did it with a great deal of innovation and hard work. The required electronics has now been reduced to 2-3 small circuit boards and a video server the size of a PC. 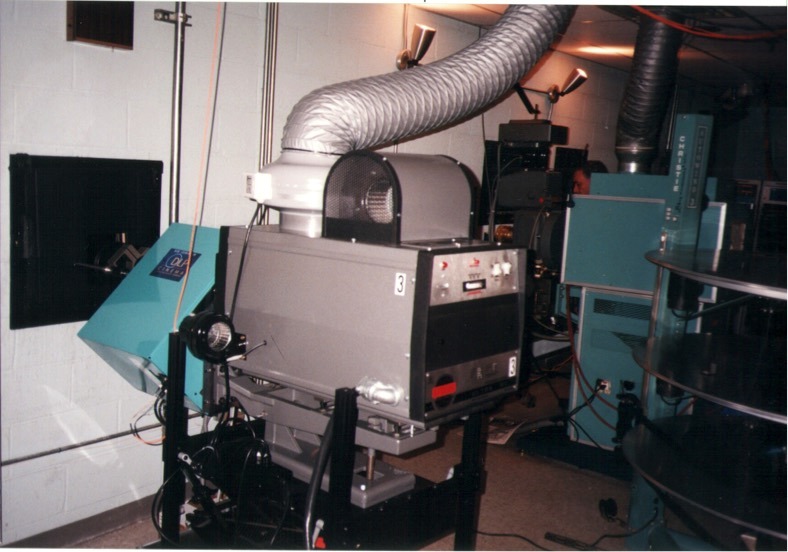 The original DLP Cinema® projector was hung on the font of a lamp housing similar to how film projectors were hung (as can be seen in the background). Today everything (lamp, optics, electronics, and power supplies) is contained within a much more compact and stylish form factor as can be seen below. Following the digital premier of Star Wars Episode I, which flawlessly validated the technology and architecture, several more rounds of development were needed to achieve the modern performance, form factor, and price points. 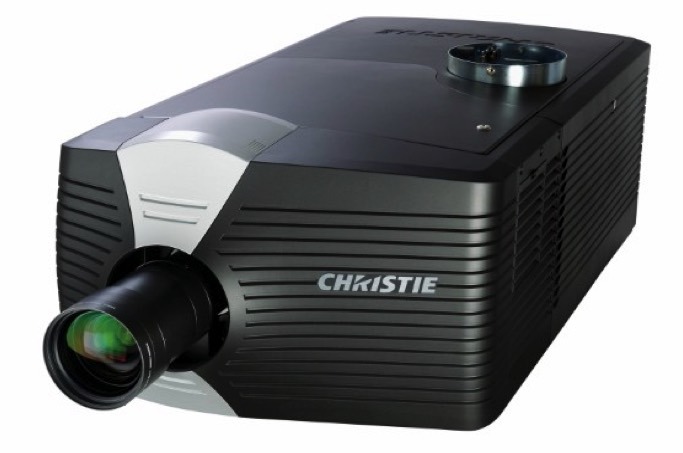 These development efforts were co-funded by the projector manufacturers and DLP Cinema® licensees - Christie Digital, Barco, and NEC - who each made significant contributions to the product design and rollout. Additional TI DLP Cinema® team members who were involved in these follow-on development stages are Jack Gregory, Tim Ryan, Steve Burket, Greg Basile, Lee Armstrong, Roger Perry, Ronnie Creech, Mike Bay, Ira Goldstein, Mark Fiechtner, Mike Zimmerman, Laura Harvey, and others. In addition to the extraordinary work of the application engineering team, all of this was enabled by the outstanding performance of the DMD (invented by Dr. Larry Hornbeck) and the large team of technologists who productized and refined this technology. The Academy of Motion Picture Arts and Sciences® recognized Dr. Larry Hornbeck with the Academy Award of Merit (Oscar Statuette) for the invention of digital micromirror technology as used in DLP Cinema® Projection. Most of the TI DLP Cinema® team members have since moved on to other projects and companies. Six members of the original DLP Cinema® team are still working together at Brass Roots on next generation technologies. Brass Roots Technologies salutes all of those involved in the development of DLP Cinema®, an extraordinary technology that has forever changed the way the world sees movies!